A significant number of network administrators have responded to the guidance given here. It should be noted that there are sites that have a single PDC for many hundreds of concurrent network clients. Network bandwidth, network bandwidth utilization, and server load are among the factors that determine the maximum number of Windows clients that can be served by a single domain controller (PDC or BDC) on a network segment. It is possible to operate with only a single PDC over a routed network. What is possible is not necessarily best practice. When Windows client network logons begin to fail with the message that the domain controller cannot be found or that the user account cannot be found (when you know it exists), that may be an indication that the domain controller is overloaded or network bandwidth is overloaded. The guidance given for PDC/BDC ratio to Windows clients is conservative and if followed will minimize problems but it is not absolute. When a Windows client logs onto the network, many data packets are exchanged between the client and the server that is providing the network logon services. Each request between the client and the server must complete within a specific time limit. This is one of the primary factors that govern the installation of multiple domain controllers (usually called secondary or backup controllers). As a rough rule, there should be one such backup controller for every 30 to 150 clients. The actual limits are determined by network operational characteristics. If the domain controller provides only network logon services and all file and print activity is handled by domain member servers, one domain	controller per 150 clients on a single network segment may suffice. In any case, it is highly recommended to have a minimum of one domain controller (PDC or BDC) per network segment. 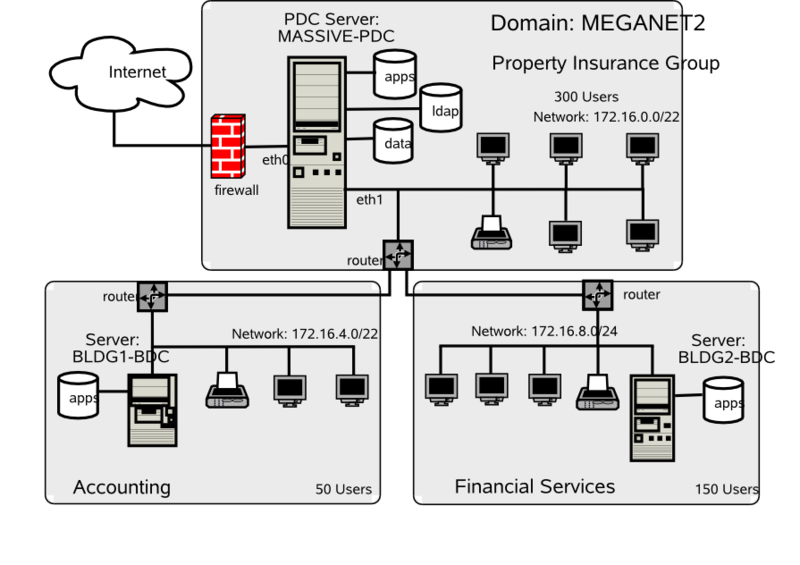 It is better to have at least one BDC on the network segment that has a PDC. If the domain controller is also used as a file and print server, the number of clients it can service reliably is reduced, and generally for low powered hardware should not exceed 30 machines (Windows workstations plus domain member servers) per domain controller. Many sites are able to operate with more clients per domain controller, the number of clients that can be supported is limited by the CPU speed, memory and the workload on the Samba server as well as network bandwidth utilization. Excessive delays in the resolution of a NetBIOS name to its IP address. This may be observed when an overloaded domain controller is also the WINS server. Another cause may be the failure to use a WINS server (this assumes that there is a single network segment). Network traffic collisions due to overloading of the network segment. One short-term workaround to this may be to replace network HUBs with Ethernet switches. Defective networking hardware. Over the past few years, we have seen on the Samba mailing list a significant increase in the number of problems that were traced to a defective network interface controller, a defective HUB or Ethernet switch, or defective cabling. In most cases, it was the erratic nature of the problem that ultimately pointed to the cause of the problem. Excessively large roaming profiles. This type of problem is typically the result of poor user education as well as poor network management. It can be avoided by users not storing huge quantities of email in MS Outlook PST files as well as by not storing files on the desktop. These are old bad habits that require much discipline and vigilance on the part of network management. You should verify that the Windows XP WebClient service is not running. The use of the WebClient service has been implicated in many Windows networking-related problems. No matter what the cause, a sudden loss of access to network resources can result in BSOD (blue screen of death) situations that necessitate rebooting of the client workstation. In the case of a mild problem, retrying to access the network drive of the printer may restore operations, but in any case this is a serious problem that may lead to the next problem, data corruption. Data corruption is one of the most serious problems. It leads to uncertainty, anger, and frustration, and generally precipitates immediate corrective demands. Management response to this type of problem may be rational, as well as highly irrational. There have been cases where management has fired network staff for permitting this situation to occur without immediate correction. There have been situations where perfectly functional hardware was thrown out and replaced, only to find the problem caused by a low-cost network hardware item. There have been cases where server operating systems were replaced, or where Samba was updated, only to later isolate the problem due to defective client software. In this chapter, you can work through a number of measures that significantly arm you to anticipate and combat network performance issues. You can work through complex and thorny methods to improve the reliability of your network environment, but be warned that all such steps demand the price of complexity. Computer (machine) accounts can be placed wherever you like in an LDAP directory subject to some constraints that are described in this section. The POSIX and SambaSAMAccount components of computer (machine) accounts are both used by Samba. That is, machine accounts are treated inside Samba in the same way that Windows NT4/200X treats them. A user account and a machine account are indistinguishable from each other, except that the machine account ends in a $ character, as do trust accounts. The need for Windows user, group, machine, trust, and other such accounts to be tied to a valid UNIX UID is a design decision that was made a long way back in the history of Samba development. It is unlikely that this decision will be reversed or changed during the remaining life of the Samba-3.x series. The resolution of a UID from the Windows SID is achieved within Samba through a mechanism that must refer back to the host operating system on which Samba is running. The name service switch (NSS) is the preferred mechanism that shields applications (like Samba) from the need to know everything about every host OS it runs on. Samba asks the host OS to provide a UID via the “passwd”, “shadow” and “group” facilities in the NSS control (configuration) file. The best tool for achieving this is left up to the UNIX administrator to determine. It is not imposed by Samba. Samba provides winbindd together with its support libraries as one method. It is possible to do this via LDAP, and for that Samba provides the appropriate hooks so that all account entities can be located in an LDAP directory. For many the weapon of choice is to use the PADL nss_ldap utility. This utility must be configured so that computer accounts can be resolved to a POSIX/UNIX account UID. That is fundamentally an LDAP design question. The information provided on the Samba list and in the documentation is directed at providing working examples only. The design of an LDAP directory is a complex subject that is beyond the scope of this documentation. A few months ago we sat down to design the network. We discussed the challenges ahead and we all agreed to compromise our design to keep it simple. We knew there would be problems, but anticipated that we would have some time to resolve any issues that might be encountered. As you now know, we started off on the wrong foot. We have a lot of unhappy users. One of them resigned yesterday afternoon because she was under duress to complete some critical projects. She suffered a blue screen of death situation just as she was finishing four hours of intensive work, all of which was lost. She has a unique requirement that involves storing large files on her desktop. Mary's desktop profile is nearly 1 GB in size. As a result of her desktop configuration, it takes her nearly 15 minutes just to log onto her workstation. But that is not enough. Because all network logon traffic passes over the network links between our buildings, logging on may take three or four attempts due to blue screen problems associated with network timeouts. A few of us worked to help her out of trouble. We convinced her to stay and promised to fully resolve the difficulties she is facing. We have no choice. We must implement LDAP and set hard limits on what our users can do with their desktops. Otherwise, we face staff losses that can surely do harm to our growth as well as to staff morale. I am sure we can better deal with the consequences of what we know we must do than we can with the unrest we have now. Stan and I have discussed the current situation. We are resolved to help our users and protect the well being of Abmas. Please acknowledge this advice with consent to proceed as required to regain control of our vital IT operations. Christine, Your diligence and attention to detail are much valued. Stan and I fully support your proposals to resolve the issues. I am confident that your plans fully realized will significantly boost staff morale. Please go ahead with your plans. If you have any problems, please let me know. Please let Stan know what the estimated cost will be so I can approve the expense. Do not wait for approval; I appreciate the urgency. Implement Backup Domain Controllers (BDCs) in each building. This involves a change from a tdbsam backend that was used in the previous chapter to an LDAP-based backend. You can implement a single central LDAP server for this purpose. Rectify the problem of excessive logon times. This involves redirection of folders to network shares as well as modification of all user desktops to exclude the redirected folders from being loaded at login time. You can also create a new default profile that can be used for all new users. You configure a new MS Windows XP Professional workstation disk image that you roll out to all desktop users. The instructions you have created are followed on a staging machine from which all changes can be carefully tested before inflicting them on your network users. This is the last network example in which specific mention of printing is made. The example again makes use of the CUPS printing system. Novell eDirectory is being successfully used by some sites. Information on how to use eDirectory can be obtained from the Samba mailing lists or from Novell. IBM Tivoli Directory Server can be used to provide the Samba LDAP backend. Example schema files are provided in the Samba source code tarball under the directory ~samba/example/LDAP. Sun ONE Identity Server product suite provides an LDAP server that can be used for Samba. Example schema files are provided in the Samba source code tarball under the directory ~samba/example/LDAP. A word of caution is fully in order. OpenLDAP is purely an LDAP server, and unlike commercial offerings, it requires that you manually edit the server configuration files and manually initialize the LDAP directory database. OpenLDAP itself has only command-line tools to help you to get OpenLDAP and Samba-3 running as required, albeit with some learning curve challenges. For most sites, the deployment of Microsoft Active Directory from the shrink-wrapped installation is quite adequate. If you are migrating from Microsoft Active Directory, be warned that OpenLDAP does not include GUI-based directory management tools. Even a simple task such as adding users to the OpenLDAP database requires an understanding of what you are doing, why you are doing it, and the tools that you must use. When installed and configured, an OpenLDAP Identity Management backend for Samba functions well. High availability operation may be obtained through directory replication/synchronization and master/slave server configurations. OpenLDAP is a mature platform to host the organizational directory infrastructure that can include all UNIX accounts, directories for electronic mail, and much more. The price paid through learning how to design an LDAP directory schema in implementation and configuration of management tools is well rewarded by performance and flexibility and the freedom to manage directory contents with greater ability to back up, restore, and modify the directory than is generally possible with Microsoft Active Directory. A comparison of OpenLDAP with Microsoft Active Directory does not do justice to either. OpenLDAP is an LDAP directory tool-set. Microsoft Active Directory Server is an implementation of an LDAP server that is largely preconfigured for a specific task orientation. It comes with a set of administrative tools that is entirely customized for the purpose of running MS Windows applications that include file and print services, Microsoft Exchange server, Microsoft SQL server, and more. The complexity of OpenLDAP is highly valued by the UNIX administrator who wants to build a custom directory solution. Microsoft provides an application called MS ADAM that provides more generic LDAP services, yet it does not have the vanilla-like services of OpenLDAP. You may wish to consider outsourcing the development of your OpenLDAP directory to an expert, particularly if you find the challenge of learning about LDAP directories, schemas, configuration, and management tools and the creation of shell and Perl scripts a bit challenging. OpenLDAP can be easily customized, though it includes many ready-to-use schemas. Samba-3 provides an OpenLDAP schema file that is required for use as a passdb backend. For those who are willing to brave the process of installing and configuring LDAP and Samba-3 interoperability, there are a few nice Web-based tools that may help you to manage your users and groups more effectively. The Web-based tools you might like to consider include the LDAP Account Manager (LAM) and the Webmin-based Webmin Idealx CGI tools. Some additional LDAP tools should be mentioned. Every so often a Samba user reports using one of these, so it may be useful to them: GQ, a GTK-based LDAP browser; LDAP Browser/Editor ; JXplorer (by Computer Associates); and phpLDAPadmin. The following prescriptive guidance is not an LDAP tutorial. The LDAP implementation expressly uses minimal security controls. No form of secure LDAP communications is attempted. The LDAP configuration information provided is considered to consist of the barest essentials only. You are strongly encouraged to learn more about LDAP before attempting to deploy it in a business-critical environment. Information to help you get started with OpenLDAP is available from the OpenLDAP web site. Many people have found the book LDAP System Administration, by Jerry Carter quite useful. Mary's problems are due to two factors. First, the absence of a domain controller on the local network is the main cause of the errors that result in blue screen crashes. Second, Mary has a large profile that must be loaded over the WAN connection. The addition of BDCs on each network segment significantly improves overall network performance for most users, but it is not enough. You must gain control over user desktops, and this must be done in a way that wins their support and does not cause further loss of staff morale. The following procedures solve this problem. There is also an opportunity to implement smart printing features. You add this to the Samba configuration so that future printer changes can be managed without need to change desktop configurations. You add the ability to automatically download new printer drivers, even if they are not installed in the default desktop profile. Only one example of printing configuration is given. It is assumed that you can extrapolate the principles and use them to install all printers that may be needed. The use of LDAP with Samba-3 makes it necessary to store UNIX accounts as well as Windows Networking accounts in the LDAP backend. This implies the need to use the PADL LDAP tools. The resolution of the UNIX group name to its GID must be enabled from either the /etc/group or from the LDAP backend. This requires the use of the PADL nss_ldap tool-set that integrates with the NSS. The same requirements exist for resolution of the UNIX username to the UID. The relationships are demonstrated in “The Interaction of LDAP, UNIX Posix Accounts and Samba Accounts”. You configure OpenLDAP so that it is operational. Before deploying the OpenLDAP, you really ought to learn how to configure secure communications over LDAP so that site security is not at risk. This is not covered in the following guidance. When OpenLDAP has been made operative, you configure the PDC called MASSIVE. You initialize the Samba secrets.tdb file. Then you create the LDAP Interchange Format (LDIF) file from which the LDAP database can be initialized. You need to decide how best to create user and group accounts. A few hints are, of course, provided. You can also find on the enclosed CD-ROM, in the Chap06 directory, a few tools that help to manage user and group configuration. In order to effect folder redirection and to add robustness to the implementation, create a network default profile. All network users workstations are configured to use the new profile. Roaming profiles will automatically be deleted from the workstation when the user logs off. The profile is configured so that users cannot change the appearance of their desktop. This is known as a mandatory profile. You make certain that users are able to use their computers efficiently. A network logon script is used to deliver flexible but consistent network drive connections. Samba versions prior to 3.0.11 necessitated the use of a domain administrator account that maps to the UNIX UID=0. The UNIX operating system permits only the root user to add user and group accounts. Samba 3.0.11 introduced a new facility known as Privileges, which provides five new privileges that can be assigned to users and/or groups; see Table 5.1. In this network example use is made of one of the supported privileges purely to demonstrate how any user can now be given the ability to add machines to the domain using a normal user account that has been given the appropriate privileges. As XP roaming profiles grow, so does the amount of time it takes to log in and out. An XP roaming profile consists of the HKEY_CURRENT_USER hive file NTUSER.DAT and a number of folders (My Documents, Application Data, Desktop, Start Menu, Templates, NetHood, Favorites, and so on). When a user logs onto the network with the default configuration of MS Windows NT/200x/XPP, all this data is copied to the local machine under the C:\Documents and Settings\%USERNAME% directory. While the user is logged in, any changes made to any of these folders or to the HKEY_CURRENT_USER branch of the registry are made to the local copy of the profile. At logout the profile data is copied back to the server. This behavior can be changed through appropriate registry changes and/or through changes to the default user profile. In the latter case, it updates the registry with the values that are set in the profile NTUSER.DAT file. The first challenge is to reduce the amount of data that must be transferred to and from the profile server as roaming profiles are processed. This includes removing all the shortcuts in the Recent directory, making sure the cache used by the Web browser is not being dumped into the Application Data folder, removing the Java plug-ins cache (the .jpi_cache directory in the profile), as well as training the user to not place large files on the desktop and to use his or her mapped home directory instead of the My Documents folder for saving documents. Using a folder other than My Documents is a nuisance for some users, since many applications use it by default. The secret to rapid loading of roaming profiles is to prevent unnecessary data from being copied back and forth, without losing any functionality. This is not difficult; it can be done by making changes to the Local Group Policy on each client as well as changing some paths in each user's NTUSER.DAT hive. Every user profile has its own NTUSER.DAT file. This means you need to edit every user's profile, unless a better method can be followed. Fortunately, with the right preparations, this is not difficult. It is possible to remove the NTUSER.DAT file from each user's profile. Then just create a Network Default Profile. Of course, it is necessary to copy all files from redirected folders to the network share to which they are redirected. Without an Active Directory PDC, you cannot take full advantage of Group Policy Objects. However, you can still make changes to the Local Group Policy by using the Group Policy editor (gpedit.msc). The Exclude directories in roaming profile settings can be found under User Configuration → Administrative Templates → System → User Profiles. By default this setting contains “Local Settings; Temporary Internet Files; History; Temp”. Simply add the folders you do not wish to be copied back and forth to this semicolon-separated list. Note that this change must be made on all clients that are using roaming profiles. There are two changes that should be done to each user's profile. Move each of the directories that you have excluded from being copied back and forth out of the usual profile path. Modify each user's NTUSER.DAT file to point to the new paths that are shared over the network instead of to the default path (C:\Documents and Settings\%USERNAME%). The above modifies existing user profiles. So that newly created profiles have these settings, you need to modify the NTUSER.DAT in the C:\Documents and Settings\Default User folder on each client machine, changing the same registry keys. You could do this by copying NTUSER.DAT to a Linux box and using regedt32. The basic method is described under “Configuration of Default Profile with Folder Redirection”. If you are using Samba as your PDC, you should create a file share called NETLOGON and within that create a directory called Default User, which is a copy of the desired default user configuration (including a copy of NTUSER.DAT). If this share exists and the Default User folder exists, the first login from a new account pulls its configuration from it. See also the Real Men Don't Click Web site. The subject of printing is quite topical. Printing problems run second place to name resolution issues today. So far in this book, you have experienced only what is generally known as “dumb” printing. Dumb printing is the arrangement by which all drivers are manually installed on each client and the printing subsystems perform no filtering or intelligent processing. Dumb printing is easily understood. It usually works without many problems, but it has its limitations also. Dumb printing is better known as Raw-Print-Through printing. Samba permits the configuration of smart printing using the Microsoft Windows point-and-click (also called drag-and-drop) printing. What this provides is essentially the ability to print to any printer. If the local client does not yet have a driver installed, the driver is automatically downloaded from the Samba server and installed on the client. Drag-and-drop printing is neat; it means the user never needs to fuss with driver installation, and that is a Good Thing,™ isn't it? There is a further layer of print job processing that is known as intelligent printing that automatically senses the file format of data submitted for printing and then invokes a suitable print filter to convert the incoming data stream into a format suited to the printer to which the job is dispatched. The CUPS printing subsystem is capable of intelligent printing. It has the capacity to detect the data format and apply a print filter. This means that it is feasible to install on all Windows clients a single printer driver for use with all printers that are routed through CUPS. The most sensible driver to use is one for a PostScript printer. Fortunately, Easy Software Products, the authors of CUPS, have released a PostScript printing driver for Windows. It can be installed into the Samba printing backend so that it automatically downloads to the client when needed. This means that so long as there is a CUPS driver for the printer, all printing from Windows software can use PostScript, no matter what the actual printer language for the physical device is. It also means that the administrator can swap out a printer with a totally different type of device without ever needing to change a client workstation driver. This book is about Samba-3, so you can confine the printing style to just the smart style of installation. Those interested in further information regarding intelligent printing should review documentation on the Easy Software Products Web site. It has often been said that there are three types of people in the world: those who have sharp minds and those who forget things. Please do not ask what the third group is like! Well, it seems that many of us have company in the second group. There must be a good explanation why so many network administrators fail to solve apparently simple problems efficiently and effectively. If you are now asking yourself how problems can be avoided, the best advice is to start out your learning experience with a known-good configuration. After you have seen a fully working solution, a good way to learn is to make slow and progressive changes that cause things to break, then observe carefully how and why things ceased to work. The examples in this chapter (also in the book as a whole) are known to work. That means that they could serve as the kick-off point for your journey through fields of knowledge. Use this resource carefully; we hope it serves you well. Do not be lulled into thinking that you can easily adopt the examples in this book and adapt them without first working through the examples provided. A little thing overlooked can cause untold pain and may permanently tarnish your experience. The name service caching daemon (nscd) is a primary cause of difficulties with name resolution, particularly where winbind is used. Winbind does its own caching, thus nscd causes double caching which can lead to peculiar problems during debugging. As a rule, it is a good idea to turn off the name service caching daemon. # An example Name Service Cache config file. This file is needed by nscd. In the example /etc/openldap/slapd.conf control file (see “LDAP DB_CONFIG File”) there is an entry for loglevel	256. To enable logging via the syslog infrastructure, it is necessary to uncomment this parameter and restart slapd. In this case, all LDAP-related logs will be directed to the file /var/log/ldaplogs. This makes it easy to track LDAP errors. The snippet provides a simple example of usage that can be modified to suit local site needs. The configuration used later in this chapter reflects such customization with the intent that LDAP log files will be stored at a location that meets local site needs and wishes more fully. Verify the nss_base_passwd, nss_base_shadow, nss_base_group entries in the /etc/ldap.conf file and compare them closely with the directory tree location that was chosen when the directory was first created. Each such lookup will create an entry in the /data/log directory for each such process executed. The contents of each file created in this directory may provide a hint as to the cause of the a problem that is under investigation. Check that the bindpw entry in the /etc/ldap.conf or in the /etc/ldap.secrets file is correct, as specified in the /etc/openldap/slapd.conf file. Search for hints of what may have failed by looking for the words fail and error. MS Windows 2000 Professional and Windows XP Professional clients can be configured to create a netlogon.log file that can be very helpful in diagnosing network logon problems. Search the Microsoft knowledge base for detailed instructions. The techniques vary a little with each version of MS Windows. MS Windows network users are generally very sensitive to limits that may be imposed when confronted with locked-down workstation configurations. The challenge you face must be promoted as a choice between reliable, fast network operation and a constant flux of problems that result in user irritation. The network design shown in “Network Topology 500 User Network Using ldapsam passdb backend” is not comprehensive. It is assumed that you will install additional file servers and possibly additional BDCs. All configuration files and locations are shown for SUSE Linux 9.2 and are equally valid for SUSE Linux Enterprise Server 9. The file locations for Red Hat Linux are similar. You may need to adjust the locations for your particular Linux system distribution/implementation. The following information applies to Samba-3.0.20 when used with the Idealx smbldap-tools scripts version 0.9.1. If using a different version of Samba or of the smbldap-tools tarball, please verify that the versions you are about to use are matching. The smbldap-tools package uses counter-entries in the LDAP directory to avoid duplication of the UIDs and GIDs that are issued for POSIX accounts. The LDAP rdn under which this information is stored are called uidNumber and gidNumber respectively. These may be located in any convenient part of the directory information tree (DIT). In the examples that follow they have been located under dn=sambaDomainName=MEGANET2,dc=abmas,dc=org. They could just as well be located under the rdn cn=NextFreeUnixId. The steps in the process involve changes from the network configuration shown in “The 500-User Office”. Before implementing the following steps, you must have completed the network implementation shown in that chapter. If you are starting with newly installed Linux servers, you must complete the steps shown in “Installation of DHCP, DNS, and Samba Control Files” before commencing at “OpenLDAP Server Configuration”. Confirm that the packages shown in “Required OpenLDAP Linux Packages” are installed on your system. Samba-3 and OpenLDAP will have a degree of interdependence that is unavoidable. The method for bootstrapping the LDAP and Samba-3 configuration is relatively straightforward. If you follow these guidelines, the resulting system should work fine. Install the file shown in “LDAP Master Configuration File /etc/openldap/slapd.conf Part A” in the directory /etc/openldap. This may require you to add a user and a group account for LDAP if they do not exist. Install the file shown in “LDAP DB_CONFIG File” in the directory /data/ldap. In the event that this file is added after ldap has been started, it is possible to cause the new settings to take effect by shutting down the LDAP server, executing the db_recover command inside the /data/ldap directory, and then restarting the LDAP server. Performance logging can be enabled and should preferably be sent to a file on a file system that is large enough to handle significantly sized logs. To enable the logging at a verbose level to permit detailed analysis, uncomment the entry in the /etc/openldap/slapd.conf shown as “loglevel 256”. Note: The path /data/ldap/log should be set at a location that is convenient and that can store a large volume of data. The steps that follow involve configuration of LDAP, NSS LDAP-based resolution of users and groups. Also, so that LDAP-based accounts can log onto the system, the steps ahead configure the Pluggable Authentication Modules (PAM) to permit LDAP-based authentication. Since you have chosen to put UNIX user and group accounts into the LDAP database, it is likely that you may want to use them for UNIX system (Linux) local machine logons. This necessitates correct configuration of PAM. The pam_ldap open source package provides the PAM modules that most people would use. On SUSE Linux systems, the pam_unix2.so module also has the ability to redirect authentication requests through LDAP. You have chosen to configure these services by directly editing the system files, but of course, you know that this configuration can be done using system tools provided by the Linux system vendor. SUSE Linux has a facility in YaST (the system admin tool) through yast → system → ldap-client that permits configuration of SUSE Linux as an LDAP client. Red Hat Linux provides the authconfig tool for this. The preferred and usual location is /etc/ldap.conf. On the server MASSIVE, install the file shown in “Configuration File for NSS LDAP Support /etc/ldap.conf” into the path that was obtained from the step above. On the servers called BLDG1 and BLDG2, install the file shown in “Configuration File for NSS LDAP Clients Support /etc/ldap.conf” into the path that was obtained from the step above. Later, when the LDAP database has been initialized and user and group accounts have been added, you can validate resolution of the LDAP resolver process. The inclusion of WINS-based hostname resolution is deliberate so that all MS Windows client hostnames can be resolved to their IP addresses, whether or not they are DHCP clients. Some Linux systems (Novell SUSE Linux in particular) add entries to the nsswitch.conf file that may cause operational problems with the configuration methods adopted in this book. It is advisable to comment out the entries passwd_compat and group_compat where they are found in this file. Even at the risk of overstating the issue, incorrect and inappropriate configuration of the nsswitch.conf file is a significant cause of operational problems with LDAP. This example does have the LDAP-enabled pam_unix2.so, but simply demonstrates the use of the pam_ldap.so module. You can use either implementation, but if the pam_unix2.so on your system supports LDAP, you probably want to use it rather than add an additional module. Verify that the Samba-3.0.20 (or later) packages are installed on each SUSE Linux server before following the steps below. If Samba-3.0.20 (or later) is not installed, you have the choice to either build your own or obtain the packages from a dependable source. Packages for SUSE Linux 8.x, 9.x, and SUSE Linux Enterprise Server 9, as well as for Red Hat Fedora Core and Red Hat Enterprise Linux Server 3 and 4, are included on the CD-ROM that is included with this book. Install the files in “LDAP Based smb.conf File, Server: MASSIVE global Section: Part A”, “LDAP Based smb.conf File, Server: MASSIVE global Section: Part B”, “LDAP Based smb.conf File, Shares Section Part A”, and “LDAP Based smb.conf File, Shares Section Part B” into the /etc/samba/ directory. The three files should be added together to form the smb.conf master file. It is a good practice to call this file something like smb.conf.master and then to perform all file edits on the master file. The operational smb.conf is then generated as shown in the next step. If, after a short delay (a few seconds), the domain SID has still not been written to the secrets.tdb file, it is necessary to investigate what may be misconfigured. In this case, carefully check the smb.conf file for typographical errors (the most common problem). The use of the testparm is highly recommended to validate the contents of this file. When a positive domain SID has been reported, stop Samba. Your Samba-3 PDC is now ready to communicate with the LDAP password backend. Let's get on with configuration of the LDAP server. add user script = /opt/IDEALX/sbin/smbldap-useradd -m "%u"
delete user script = /opt/IDEALX/sbin/smbldap-userdel "%u"
add group script = /opt/IDEALX/sbin/smbldap-groupadd -p "%g"
delete group script = /opt/IDEALX/sbin/smbldap-groupdel "%g"
add user to group script = /opt/IDEALX/sbin/smbldap-groupmod -m "%u" "%g"
delete user from group script = /opt/IDEALX/sbin/smbldap-groupmod -x "%u" "%g"
set primary group script = /opt/IDEALX/sbin/smbldap-usermod -g "%g" "%u"
add machine script = /opt/IDEALX/sbin/smbldap-useradd -w "%u"
The Idealx scripts, or equivalent, are necessary to permit Samba-3 to manage accounts on the LDAP server. You have chosen the Idealx scripts because they are the best-known LDAP configuration scripts. The use of these scripts will help avoid the necessity to create custom scripts. It is easy to download them from the Idealx Web site. The tarball may be directly downloaded from this site also. Alternatively, you may obtain the smbldap-tools-0.9.1-1.src.rpm file that may be used to build an installable RPM package for your Linux system. The smbldap-tools scripts can be installed in any convenient directory of your choice, in which case you must change the path to them in your smb.conf file on the PDC (MASSIVE). The smbldap-tools are located in /opt/IDEALX/sbin. The scripts are not needed on BDC machines because all LDAP updates are handled by the PDC alone. If you wish to use the downloaded tarball, unpack the smbldap-tools in a suitable temporary location. Change into either the directory extracted from the tarball or the smbldap-tools directory in your /usr/share/doc/packages directory tree. The smbldap-tools scripts are now ready for the configuration step outlined in “Configuration of smbldap-tools”. Note: Any suitable directory can be specified. A build process that has completed without error will place the installable binary files in the directory ../RPMS/noarch. The Idealx scripts should now be ready for configuration using the steps outlined in Configuration of smbldap-tools. The smbldap-tools require that the NetBIOS name (machine name) of the Samba server be included in the smb.conf file. Change into the directory that contains the configure.pl script. Since a slave LDAP server has not been configured, it is necessary to specify the IP address of the master LDAP server for both the master and the slave configuration prompts. Change to the directory that contains the smbldap.conf file, then verify its contents. The smbldap-tools are now ready for use. 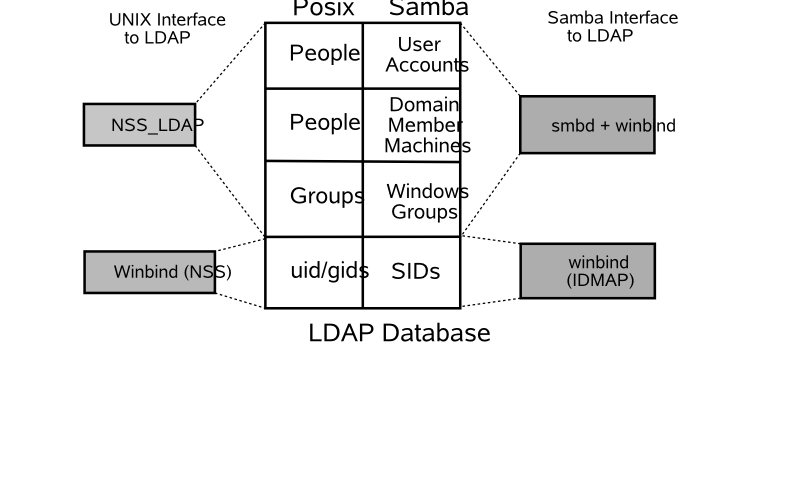 The LDAP database must be populated with well-known Windows domain user accounts and domain group accounts before Samba can be used. The following procedures step you through the process. At this time, Samba-3 requires that on a PDC all UNIX (POSIX) group accounts that are mapped (linked) to Windows domain group accounts must be in the LDAP database. It does not hurt to have UNIX user and group accounts in both the system files as well as in the LDAP database. From a UNIX system perspective, the NSS resolver checks system files before referring to LDAP. If the UNIX system can resolve (find) an account in the system file, it does not need to ask LDAP. If you always have a user account in the /etc/passwd on every server or in a NIS(+) backend, it is not necessary to add POSIX accounts for them in LDAP. In this case, you can add Windows domain user accounts using the pdbedit utility. Use of this tool from the command line adds the SambaSamAccount entry for the user, but does not add the PosixAccount entry for the user. This is the least desirable method because when LDAP is used as the passwd backend Samba expects the POSIX account to be in LDAP also. It is possible to use the PADL account migration tool to migrate all system accounts from either the /etc/passwd files, or from NIS, to LDAP. If you decide that it is probably a good idea to add both the PosixAccount attributes as well as the SambaSamAccount attributes for each user, then a suitable script is needed. In the example system you are installing in this exercise, you are making use of the Idealx smbldap-tools scripts. A copy of these tools, preconfigured for this system, is included on the enclosed CD-ROM under Chap06/Tools. If you wish to have more control over how the LDAP database is initialized or if you don't want to use the Idealx smbldap-tools, you should refer to “A Collection of Useful Tidbits”, “Alternative LDAP Database Initialization”. The following steps initialize the LDAP database, and then you can add user and group accounts that Samba can use. You use the smbldap-populate to seed the LDAP database. You then manually add the accounts shown in “Abmas Network Users and Groups”. The list of users does not cover all 500 network users; it provides examples only. In the following examples, as the LDAP database is initialized, we do create a container for Computer (machine) accounts. In the Samba-3 smb.conf files, specific use is made of the People container, not the Computers container, for domain member accounts. This is not a mistake; it is a deliberate action that is necessitated by the fact that the resolution of a machine (computer) account to a UID is done via NSS. The only way this can be handled is using the NSS (/etc/nsswitch.conf) entry for passwd, which is resolved using the nss_ldap library. The configuration file for the nss_ldap library is the file /etc/ldap.conf that provides only one possible LDAP search command that is specified by the entry called nss_base_passwd. This means that the search path must take into account the directory structure so that the LDAP search will commence at a level that is above both the Computers container and the Users (or People) container. If this is done, it is necessary to use a search that will descend the directory tree so that the machine account can be found. Alternatively, by placing all machine accounts in the People container, we are able to sidestep this limitation. This is the simpler solution that has been adopted in this chapter. Change to the /opt/IDEALX/sbin directory. Samba automatically populates this LDAP directory container when it needs to. root#  ldapsearch -x -b "dc=abmas,dc=biz" "(ObjectClass=*)"
Good. It is all working just fine. This demonstrates that the nss_ldap library is functioning as it should. If these two steps fail to produce this information, refer to “Avoiding Failures: Solving Problems Before They Happen” for diagnostic procedures that can be followed to isolate the cause of the problem. Proceed to the next step only when the previous steps have been successfully completed. where username is the login ID for each user. This demonstrates that user account resolution via LDAP is working. This confirms that the UNIX (POSIX) user account information can be resolved from LDAP by system tools that make a getentpw() system call. This demonstrates that the changes were accepted. This is precisely what we want to see. This looks good. Of course, you fully expected that it would all work, didn't you? The addition of groups does not involve keyboard interaction, so the lack of console output is of no concern. The well-known special accounts (Domain Admins, Domain Users, Domain Guests), as well as our own site-specific group accounts, are correctly listed. This is looking good. This is looking good. Congratulations it works! Note that in the above output the lines were shortened by replacing the middle value (1010554828) of the SID with the ellipsis (...). This indicates that the domain security account for the PDC has been correctly created. This shows that an anonymous connection is working. Well done. All is working fine. The server MASSIVE is now configured, and it is time to move onto the next task. The configuration for Samba-3 to enable CUPS raw-print-through printing has already been taken care of in the smb.conf file. The only preparation needed for smart printing to be possible involves creation of the directories in which Samba-3 stores Windows printing driver files. Configure all network-attached printers to have a fixed IP address. Create an entry in the DNS database on the server MASSIVE in both the forward lookup database for the zone abmas.biz.hosts and in the reverse lookup database for the network segment that the printer is to be located in. Example configuration files for similar zones were presented in “Secure Office Networking”, “DNS Abmas.biz Forward Zone File” and in “DNS 192.168.2 Reverse Zone File”. Follow the instructions in the printer manufacturers' manuals to permit printing to port 9100. Use any other port the manufacturer specifies for direct mode, raw printing. This allows the CUPS spooler to print using raw mode protocols. This step creates the necessary print queue to use no assigned print filter. This is ideal for raw printing, that is, printing without use of filters. The name printque is the name you have assigned for the particular printer. Refer to the CUPS printing manual for instructions regarding how to configure CUPS so that print queues that reside on CUPS servers on remote networks route print jobs to the print server that owns that queue. The default setting on your CUPS server may automatically discover remotely installed printers and may permit this functionality without requiring specific configuration. Install the files in “LDAP Based smb.conf File, Server: BLDG1”, “LDAP Based smb.conf File, Shares Section Part A”, and “LDAP Based smb.conf File, Shares Section Part B” into the /etc/samba/ directory. The three files should be added together to form the smb.conf file. Verify the smb.conf file as in step 2 of “Samba-3 PDC Configuration”. Carefully follow the steps outlined in “PAM and NSS Client Configuration”, taking particular note to install the correct ldap.conf. This is the correct output. If the accounts that have UIDs above 512 are not shown, there is a problem. This is also the correct and desired output, because it demonstrates that the LDAP client is able to communicate correctly with the LDAP server (MASSIVE). When configuring a Samba-3 BDC that has an LDAP backend, there is no need to take any special action to join it to the domain. However, winbind communicates with the domain controller that is running on the localhost and must be able to authenticate, thus requiring that the BDC should be joined to the domain. The process of joining the domain creates the necessary authentication accounts. This indicates that the domain security account for the BDC has been correctly created. These results show that all things are in order. Samba-3 should now be running and is ready for a quick test. But not quite yet! Install the files in “LDAP Based smb.conf File, Server: BLDG2”, “LDAP Based smb.conf File, Shares Section Part A”, and “LDAP Based smb.conf File, Shares Section Part B” into the /etc/samba/ directory. The three files should be added together to form the smb.conf file. Follow carefully the steps shown in “Samba-3 BDC Configuration”, starting at step 2. My father would say, “Dinner is not over until the dishes have been done.” The makings of a great network environment take a lot of effort and attention to detail. So far, you have completed most of the complex (and to many administrators, the interesting part of server configuration) steps, but remember to tie it all together. Here are a few more steps that must be completed so that your network runs like a well-rehearsed orchestra. In your smb.conf file, you have specified Windows shares. Each has a path parameter. Even though it is obvious to all, one of the common Samba networking problems is caused by forgetting to verify that every such share root directory actually exists and that it has the necessary permissions and ownership. You made a conscious decision to do everything it would take to improve network client performance. One of your decisions was to implement folder redirection. This means that Windows user desktop profiles are now made up of two components: a dynamically loaded part and a set of file network folders. You may permit the user to obtain a default profile. You can create a mandatory profile. You can create a group profile (which is almost always a mandatory profile). Mandatory profiles cannot be overwritten by a user. The change from a user profile to a mandatory profile is effected by renaming the NTUSER.DAT to NTUSER.MAN, that is, just by changing the filename extension. The location of the profile that a user can obtain is set in the user's account in the LDAP passdb backend. You can manage this using the Idealx smbldap-tools or using the Windows NT4 Domain User Manager. The use of a logon script with Windows XP Professional is an option that every site should consider. Unless you have locked down the desktop so the user cannot change anything, there is risk that a vital network drive setting may be broken or that printer connections may be lost. Logon scripts can help to restore persistent network folder (drive) and printer connections in a predictable manner. One situation in which such breakage may occur in particular is when a mobile PC (notebook) user attaches to another company's network that forces environment changes that are alien to your network. If you decide to use network logon scripts, by reference to the smb.conf files for the domain controllers, you see that the path to the share point for the NETLOGON share defined is /var/lib/samba/netlogon. The path defined for the logon script inside that share is scripts\logon.bat. This means that as a Windows NT/200x/XP client logs onto the network, it tries to obtain the file logon.bat from the fully qualified path /var/lib/samba/netlogon/scripts. This fully qualified path should therefore exist whether you install the logon.bat. You should research the options for logon script implementation by referring to TOSHARG2, Chapter 24, Section 24.4. A quick Web search will bring up a host of options. One of the most popular logon facilities in use today is called KiXtart. The ability to perform tasks such as joining Windows clients to the domain can be assigned to normal user accounts. By default, only the domain administrator account (root on UNIX systems because it has UID=0) can add accounts. New to Samba 3.0.11 is the ability to grant this privilege in a very limited fashion to particular accounts. By default, even Samba-3.0.11 does not grant any rights even to the Domain Admins group. Here we grant this group all privileges. Samba limits privileges on a per-server basis. This is a deliberate limitation so that users who are granted rights can be restricted to particular machines. It is left to the network administrator to determine which rights should be provided and to whom. Log onto the PDC as the root account. Repeat this step on each domain controller, in each case substituting the name of the server (e.g., BLDG1, BLDG2) in place of the PDC called MASSIVE. In the next few sections, you can configure a new Windows XP Professional disk image on a staging machine. You will configure all software, printer settings, profile and policy handling, and desktop default profile settings on this system. When it is complete, you copy the contents of the C:\Documents and Settings\Default User directory to a directory with the same name in the NETLOGON share on the domain controllers. Much can be learned from the Microsoft Support site regarding how best to set up shared profiles. One knowledge-base article in particular stands out: "How to Create a Base Profile for All Users." Log onto the Windows XP Professional workstation as the local Administrator. It is necessary to expose folders that are generally hidden to provide access to the Default User folder. Launch the Windows Explorer by clicking Start → My Computer → Tools → Folder Options → View Tab. Select Show hidden files and folders, and click OK. Exit Windows Explorer. Launch the Registry Editor. Click Start → Run. Key in regedt32, and click OK.
Give focus to HKEY_LOCAL_MACHINE hive entry in the left panel. Click File → Load Hive... → Documents and Settings → Default User → NTUSER → Open. In the dialog box that opens, enter the key name Default and click OK. The right panel reveals the contents as shown in “Windows XP Professional User Shared Folders”. 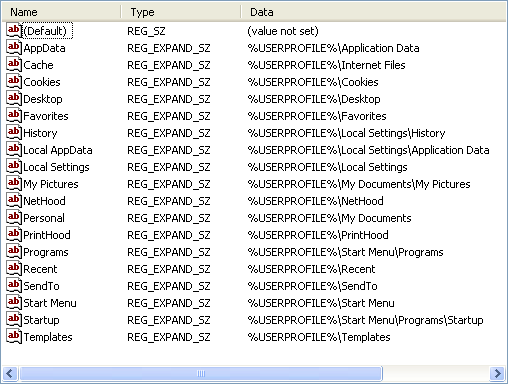 Set the registry keys as shown in “Default Profile Redirections”. Your implementation makes the assumption that users have statically located machines. Notebook computers (mobile users) need to be accommodated using local profiles. This is not an uncommon assumption. Click back to the root of the loaded hive Default. Click File → Unload Hive... → Yes. Click File → Exit. This exits the Registry Editor. Now follow the procedure given in “The Local Group Policy”. Make sure that each folder you have redirected is in the exclusion list. You are now ready to copy the Default User profile to the Samba domain controllers. Launch Microsoft Windows Explorer, and use it to copy the full contents of the directory Default User that is in the C:\Documents and Settings to the root directory of the NETLOGON share. If the NETLOGON share has the defined UNIX path of /var/lib/samba/netlogon, when the copy is complete there must be a directory in there called Default User. To launch the Windows Explorer, click Start → My Computer → Tools → Folder Options → View Tab. Deselect Show hidden files and folders, and click OK. Exit Windows Explorer. Microsoft Outlook can store a Personal Storage file, generally known as a PST file. It is the nature of email storage that this file grows, at times quite rapidly. So that users' email is available to them at every workstation they may log onto, it is common practice in well-controlled sites to redirect the PST folder to the users' home directory. Follow these steps for each user who wishes to do this. From the Control Panel, launch the Mail icon. Make a note of the location of the PST file(s). From this location, move the files to the desired new target location. The most desired new target location may well be the users' home directory. Note: If MS Outlook has been configured to use an IMAP account configuration there may be problems following these instructions. Feedback from users suggests that where IMAP is used the PST file is used to store rules and filters. When the PST store is relocated it appears to break MS Outlook's Send/Receive button. If anyone has sucessfully relocated PST files where IMAP is used please email jht@samba.org with useful tips and suggestions so that this warning can be removed or modified. Close the Date Files windows, then click Email Accounts. Select View of Change exiting email accounts, click Next. Change the Mail Delivery Location so as to use the data file in the new target location. Go back to the Data Files window, then delete the old data file entry. You may have to remove and reinstall the Outlook Address Book (Contacts) entries, otherwise the user may be not be able to retrieve contacts when addressing a new email message. Outlook Express is not at all like MS OutLook. It stores file very differently also. Outlook Express storage files can not be redirected to network shares. The options panel will not permit this, but they can be moved to folders outside of the user's profile. They can also be excluded from folder synchronization as part of the roaming profile. While it is possible to redirect the data stores for Outlook Express data stores by editing the registry, experience has shown that data corruption and loss of email messages will result. In the same vane as MS Outlook, Outlook Express data stores can become very large. When used with roaming profiles this can result in excruciatingly long login and logout behavior will files are synchronized. For this reason, it is highly recommended not to use Outlook Express where roaming profiles are used. Microsoft does not support storing PST files on network shares, although the practice does appear to be rather popular. Anyone who does relocation the PST file to a network resource should refer the Microsoft reference to better understand the issues. Apart from manually moving PST files to a network share, it is possible to set the default PST location for new accounts by following the instructions at the WindowsITPro web site. Click Start → Run. In the dialog box, enter MMC and click OK. Follow these steps to set the default behavior of the staging machine so that all roaming profiles are deleted as network users log out of the system. Click File → Add/Remove Snap-in → Add → Group Policy → Add → Finish → Close → OK.
Close the Microsoft Management Console. The settings take immediate effect and persist onto all image copies made of this system to deploy the new standard desktop system. Join your Windows XP Professional workstation (the staging machine) to the MEGANET2 domain. If you are not sure of the procedure, follow the guidance given in “A Collection of Useful Tidbits”, “Joining a Domain: Windows 200x/XP Professional”. After the machine has rebooted, log onto the workstation as the domain root (this is the Administrator account for the operating system that is the host platform for this implementation of Samba. Launch MS Windows Explorer. Navigate in the left panel. Click My Network Places → Entire Network → Microsoft Windows Network → Meganet2 → Massive. Click on Massive Printers and Faxes. Identify a printer that is shown in the right panel. Let us assume the printer is called ps01-color. Right-click on the ps01-color icon and select the Properties entry. This opens a dialog box that indicates that “The printer driver is not installed on this computer. Some printer properties will not be accessible unless you install the printer driver. Do you want to install the driver now?” It is important at this point you answer No. The printer properties panel for the ps01-color printer on the server MASSIVE is displayed. Click the Advanced tab. Note that the box labeled Driver is empty. Click the New Driver button that is next to the Driver box. This launches the “Add Printer Wizard”. The “Add Printer Driver Wizard on MASSIVE” panel is now presented. Click Next to continue. From the left panel, select the printer manufacturer. In your case, you are adding a driver for a printer manufactured by Lexmark. In the right panel, select the printer (Lexmark Optra Color 40 PS). Click Next, and then Finish to commence driver upload. A progress bar appears and instructs you as each file is being uploaded and that it is being directed at the network server \\massive\ps01-color. Click OK. It will take a minute or so to upload the settings to the server. You are now returned to the Printers and Faxes on Massive monitor. Right-click on the printer, click Properties → Device Settings. Now change the settings to suit your requirements. BE CERTAIN TO CHANGE AT LEAST ONE SETTING and apply the changes even if you need to reverse the changes back to their original settings. This is necessary so that the printer settings are initialized in the Samba printers database. Click Apply to commit your settings. Revert any settings you changed just to initialize the Samba printers database entry for this printer. If you need to revert a setting, click Apply again. Verify that all printer settings are at the desired configuration. When you are satisfied that they are, click the General tab. Now click the Print Test Page button. A test page should print. Verify that it has printed correctly. Then click OK in the panel that is newly presented. Click OK on the ps01-color on massive Properties panel. You must repeat this process for all network printers (i.e., for every printer on each server). When you have finished uploading drivers to all printers, close all applications. The next task is to install software your users require to do their work. Your network has both fixed desktop workstations as well as notebook computers. As a general rule, it is a good idea to not tamper with the operating system that is provided by the notebook computer manufacturer. Notebooks require special handling that is beyond the scope of this chapter. For desktop systems, the installation of software onto administratively centralized application servers make a lot of sense. This means that you can manage software maintenance from a central perspective and that only minimal application stubware needs to be installed onto the desktop systems. You should proceed with software installation and default configuration as far as is humanly possible and so long as it makes sense to do so. Make certain to thoroughly test and validate every aspect of software operations and configuration. When you believe that the overall configuration is complete, be sure to create a shared group profile and migrate that to the Samba server for later reuse when creating custom mandatory profiles, just in case a user may have specific needs you had not anticipated. Unjoin the domain Each workstation requires a unique name and must be independently joined into domain membership. Defragment the hard disk While not obvious to the uninitiated, defragmentation results in better performance and often significantly reduces the size of the compressed disk image. That also means it will take less time to deploy the image onto 500 workstations. This chapter introduced many new concepts. Is it a sad fact that the example presented deliberately avoided any consideration of security. Security does not just happen; you must design it into your total network. Security begins with a systems design and implementation that anticipates hostile behavior from users both inside and outside the organization. Hostile and malicious intruders do not respect barriers; they accept them as challenges. For that reason, if not simply from a desire to establish safe networking practices, you must not deploy the design presented in this book in an environment where there is risk of compromise. As a minimum, the LDAP server must be protected by way of Access Control Lists (ACLs), and it must be configured to use secure protocols for all communications over the network. Of course, secure networking does not result just from systems design and implementation but involves constant user education training and, above all, disciplined attention to detail and constant searching for signs of unfriendly or alien activities. Security is itself a topic for a whole book. Please do consult appropriate sources. Jerry Carter's book LDAP System Administration is a good place to start reading about OpenLDAP as well as security considerations. Implementation of an OpenLDAP-based passwd backend, necessary to support distributed domain control. Implementation of Samba primary and secondary domain controllers with a common LDAP backend for user and group accounts that is shared with the UNIX system through the PADL nss_ldap and pam_ldap tool-sets. Use of the Idealx smbldap-tools scripts for UNIX (POSIX) account management as well as to manage Samba Windows user and group accounts. The basics of implementation of Group Policy controls for Windows network clients. Control over roaming profiles, with particular focus on folder redirection to network drives. Use of the CUPS printing system together with Samba-based printer driver auto-download. Well, here we are at the end of this chapter and we have only ten questions to help you to remember so much. There are bound to be some sticky issues here. Why did you not cover secure practices? Isn't it rather irresponsible to instruct network administrators to implement insecure solutions? You have focused much on SUSE Linux and little on the market leader, Red Hat. Do you have a problem with Red Hat Linux? Doesn't that make your guidance irrelevant to the Linux I might be using? You did not use SWAT to configure Samba. Is there something wrong with it? You have exposed a well-used password not24get. Is that not irresponsible? The Idealx smbldap-tools create many domain group accounts that are not used. Is that a good thing? Can I use LDAP just for Samba accounts and not for UNIX system accounts? Why are the Windows domain RID portions not the same as the UNIX UID? Printer configuration examples all show printing to the HP port 9100. Does this mean that I must have HP printers for these solutions to work? Is folder redirection dangerous? I've heard that you can lose your data that way. Is it really necessary to set a local Group Policy to exclude the redirected folders from the roaming profile? Let's get this right. This is a book about Samba, not about OpenLDAP and secure communication protocols for subjects other than Samba. Earlier on, you note, that the dynamic DNS and DHCP solutions also used no protective secure communications protocols. The reason for this is simple: There are so many ways of implementing secure protocols that this book would have been even larger and more complex. The solutions presented here all work (at least they did for me). Network administrators have the interest and the need to be better trained and instructed in secure networking practices and ought to implement safe systems. I made the decision, right or wrong, to keep this material as simple as possible. The intent of this book is to demonstrate a working solution and not to discuss too many peripheral issues. This book makes little mention of backup techniques. Does that mean that I am recommending that you should implement a network without provision for data recovery and for disaster management? Back to our focus: The deployment of Samba has been clearly demonstrated. Both Red Hat Linux and SUSE Linux comply with the Linux Standards Base specifications for a standard Linux distribution. The differences are marginal. Surely you know your Linux platform, and you do have access to administration manuals for it. This book is not a Linux tutorial; it is a Samba tutorial. Let's keep the focus on the Samba part of the book; all the other bits are peripheral (but important) to creation of a total network solution. What I find interesting is the attention reviewers give to Linux installation and to the look and feel of the desktop, but does that make for a great server? In this book, I have paid particular attention to the details of creating a whole solution framework. I have not tightened every nut and bolt, but I have touched on all the issues you need to be familiar with. Over the years many people have approached me wanting to know the details of exactly how to implement a DHCP and dynamic DNS server with Samba and WINS. In this chapter, it is plain to see what needs to be configured to provide transparent interoperability. Likewise for CUPS and Samba interoperation. These are key stumbling areas for many people. At every critical junction, I have provided comparative guidance for both SUSE and Red Hat Linux. Both manufacturers have done a great job in furthering the cause of open source software. I favor neither and respect both. I like particular features of both products (companies also). No bias in presentation is intended. Oh, before I forget, I particularly like Debian Linux; that is my favorite playground. That is a good question. As it is, the smb.conf file configurations are presented in as direct a format as possible. Adding SWAT into the equation would have complicated matters. I sought simplicity of implementation. The fact is that I did use SWAT to create the files in the first place. There are people in the Linux and open source community who feel that SWAT is dangerous and insecure. Many will not touch it with a barge-pole. By not introducing SWAT, I hope to have brought their interests on board. SWAT is well covered is TOSHARG2. Well, I had to use a password of some sort. At least this one has been consistently used throughout. I guess you can figure out that in a real deployment it would make sense to use a more secure and original password. I took this up with Idealx and found them most willing to change that in the next version. Let's give Idealx some credit for the contribution they have made. I appreciate their work and, besides, it does no harm to create accounts that are not now used at some time Samba may well use them. Yes, you can do that for user accounts only. Samba requires there to be a POSIX (UNIX) group account for every Windows domain group account. But if you put your users into the system password account, how do you plan to keep all domain controller system password files in sync? I think that having everything in LDAP makes a lot of sense for the UNIX administrator who is still learning the craft and is migrating from MS Windows. Samba uses a well-known public algorithm for assigning RIDs from UIDs and GIDs. This algorithm ought to ensure that there will be no clashes with well-known RIDs. Well-known RIDs have special significance to MS Windows clients. The automatic assignment used the calculation: RID = UID x 2 + 1000. Of course, Samba does permit you to override that to some extent. See the smb.conf man page entry for algorithmic rid base. No. You can use any type of printer and must use the interfacing protocol supported by the printer. Many networks use LPR/LPD print servers to which are attached PCL printers, inkjet printers, plotters, and so on. At home I use a USB-attached inkjet printer. Use the appropriate device URI (Universal Resource Interface) argument to the lpadmin -v option that is right for your printer. The only loss of data I know of that involved folder redirection was caused by manual misuse of the redirection tool. The administrator redirected a folder to a network drive and said he wanted to migrate (move) the data over. Then he changed his mind, so he moved the folder back to the roaming profile. This time, he declined to move the data because he thought it was still in the local profile folder. That was not the case, so by declining to move the data back, he wiped out the data. You cannot hold the tool responsible for that. Caveat emptor still applies. Yes. If you do not do this, the data will still be copied from the network folder (share) to the local cached copy of the profile. There is an alternate method by which a default user profile can be added to the NETLOGON share. This facility in the Windows System tool permits profiles to be exported. The export target may be a particular user or group profile share point or else the NETLOGON share. In this case, the profile directory must be named Default User.